Venetian painter, copper engraver and wood carver. He met Drer in Venice in 1494-96. After 1500 he worked in Germany (Nuremberg, Wittenberg, Frankfurt/Oder) using the name Jakob Walch. He became court painter for the Emperor Maximilian in Nuremberg, and - from 1503-04 - the Elector Frederick III (the Wise). From 1510 he became court painter of the Governor of the Netherlands, Margaret of Austria in Brussels. He painted mainly religious and mythological pictures. He transmitted the elements of Italian Renaissance to Germany. 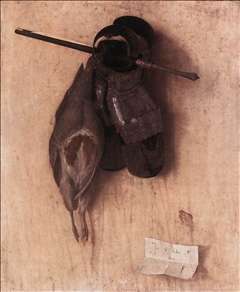 See more details about "Still-Life with Partridge and Iron Gloves"